The leaves are changing color, the morning air is cool and crisp, and pumpkin spice aromas are showing up everywhere. Fall is here! And so is our Fall Harvest Collection, packed with the power of pumpkin & turmeric, both having powerful benefits for your skin and your body. Turmeric, with its’ bright yellow-orange color, is best know as the main ingredient in curries and Indian dishes. Not only is it delicious, it also has amazing health benefits for your skin and your body. What gives turmeric its’ yellow-orange pigments are known as curcuminoids, one of which is curcumin, the herbs most active ingredient. Curcumin has been shown to have strong antioxidant properties and anti-inflammatory properties that help calm skin and reduce pain and stiffness of the muscles and joints. It also has been shown to help prevent bacterial infections and speed healing when applied to the skin. While there are many ways to reap the health benefits of Turmeric, and its’ active ingredient Curcumin, my new favorite is a hot beverage recipe that was introduced to me this summer while I was visiting good friends in CA. 1 TBSP Pure Thrive Curcumin Gold, made with ginger oil and DHA. 2 TBSP Great Lakes Collagen Hydrolysate. We both feel it has really helped with inflammation pain and muscle soreness after a run! With hints of ginger, it makes for a perfect warm beverage this time of year. Now go apply our newest mask, the Autumn Harvest Hydration Mask and sip on this warm spicy beverage to get health benefits from the inside, while nourishing your skin with this face mask from the outside. Sip, relax, sip, rinse. Our favorite Fall fruit is packed with healthy benefits for the skin and body. Experts believe that a pumpkin contains more than 100 beneficial nutrients that can help reverse the signs of aging. Pumpkin is packed with antioxidants and enzymes that help increase skin cell turnover. The enzymes digest aged, dehydrates skin cells to reveal healthier looking skin. Pumpkin is high in vitamin B3, A & C which can help soothe dry skin, stimulate collagen production and reduce fine lines. A popular fall snack, and for good reason, are Pumpkin Seeds. Pumpkin Seeds, packed with a balanced blend of Omega 3, Omega 6, Vitamin E and zinc, all working together synergistically, are known for their anti inflammatory and anti-aging properties. So, sprinkle a few pumpkin seeds & drizzle a little pumpkin seed oil on your salad to experience the health benefits that this seed has to offer! 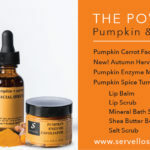 Ready to enjoy the power of pumpkin & turmeric for your skin? Take a look at our Fall Harvest Collection here. ← What mask will you be wearing this month?